Customs FOU Ikeja intercepts Truck of smuggled Codeine - Welcome to Transport Day Online!!! 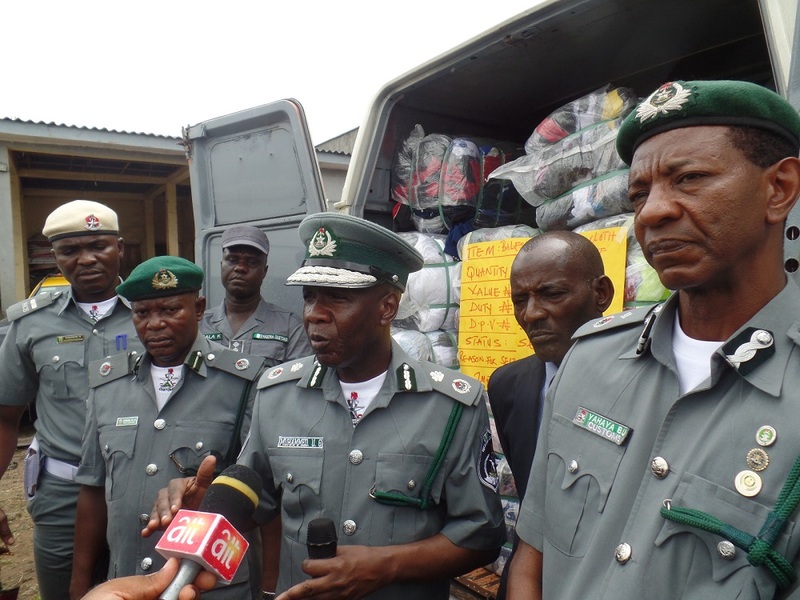 The Nigeria Customs Service, Federal Operations Unit Zone ‘A’ Ikeja, Lagos, has intercepted various contraband goods with duty paid value of over N1.120bn. The comptroller of the Federal Operation Unit, Ikeja, Mohammed Uba, who addressed press men yesterday, said his command will continue to make sure that the laws and regulations of the land must be strictly obeyed as there is no room for smuggling in Nigeria. Among the seized items include, the apprehension of an Iveco Truck, with registration number LAM283LG, along Ijebu Ode- Ore road carrying 498 cartons of CSP Codeine Cough syrup 100ml and each carton containing 200 bottles. He said “it is good to know that the federal government banned the importation of cough syrup that contains codeine and two suspects are in our custody and will be handed over to NAFDAC for further investigation”. Uba also said “it is our obligation to support the Federal government policy on Rice and encourage local farmers which in turn will create employment in Nigeria”. Other seized items include 21 exotic vehicles, 15 trailers containing 9,504 of foreign parboiled rice, 436 jerrycans of vegetable oil, 333 cartons of frozen poultry products, 287 bales of used clothing, 198 pieces of used tyres among others. He said, following the presidential directive, the Comptroller General of Customs, Col. Hameed Ali (Rtd) has directed the evacuation and distribution of 11,579 bags of foreign parboiled rice 50kg each, 627 & 485 jerry cans of vegetable oil 25 litres and 5 litres respectively, 248 bales and 219 sacks of used clothing and 33 sacks of used shoes from our warehouse to Internally Displaced Persons (IDPs) in Borno State by the Nigerian Army Corps of Supply and Transport (NACST). The Unit also apprehended two containers carrying contraband goods. The First 1/40ft container with number PCIU922650/8 was seized for carrying 525 bales of second hand clothings as against used motorcycles declared. While another 1/40ft container with no. PCIU871664/5 was seized for carrying 11 jumbo bales of jeans, 365 cartons of new slippers, and 145 cartons of new bags against adhesive dressing. The Comptroller, said “the fight against drug abuse and illicit drugs is a collective effort and if all hands are on deck, we will make our nation drug free. He also warned and advised the general public not to allow themselves to be used as shield by smugglers and their mob accomplices, especially in Southwest Zones.